Here, Duiker and Bijvoet demonstrated for the first time their ideas on lightweight, low-cost building. 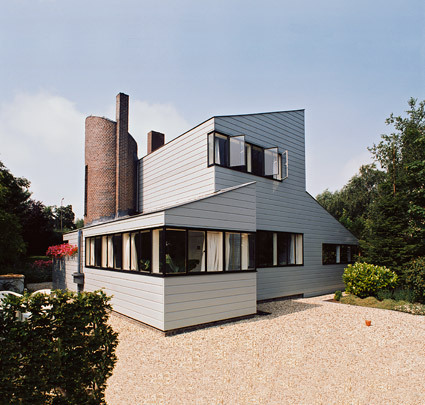 Sloping, rectangular volumes reflect their individual functions of shed, house and conservatory. The similarly bevelled cylindrical stairwell is the sole brick component of this otherwise wooden house. In 1987, after having been hidden for years under a layer of plaster, its timber facades were fully restored to their original state.